A rare global economic expansion after an extended period of contraction and slow growth has resulted in some dramatic inflation across a wide range of polymeric materials including thermoplastics, thermosets, and elastomeric materials. Important forces driving raw material inflation include the surge in oil prices to $60 per barrel, weather events in the United States impacting refineries and polymeric processing plants, and tighter environmental regulations impacting global supply chains. In addition, the long economic malaise since 2008 largely limited reinvestment in supply capacity due to pricing and margin erosion throughout the downturn resulting in a slow ramp-up in supply capacity with this recent economic growth. 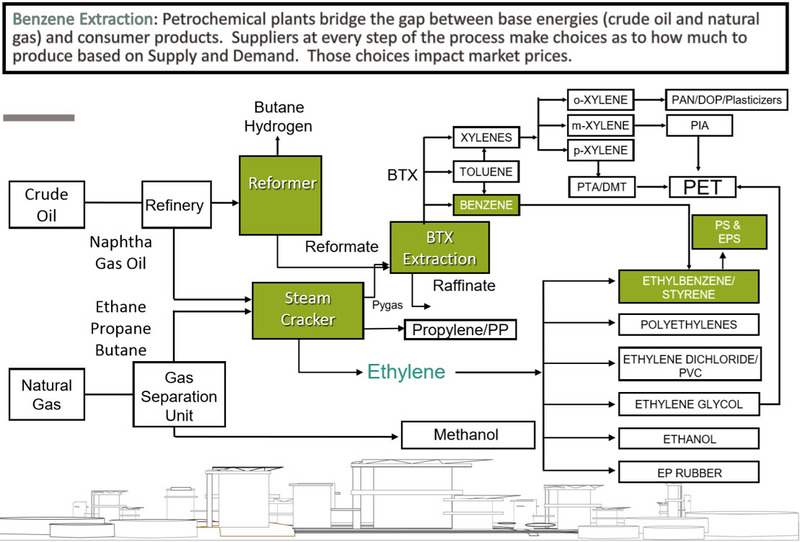 Most thermoplastic, thermoset, and elastomeric polymers are petrochemical process derivatives with benzene being a primary precursor for many raw materials. The United States is still a net benzene importer subject to swings in international market pricing. Currently, Benzene prices are at a three-year high. In addition, US refining capacity constraints have limited petrochemical derivative supply. For instance, several specialty phenolic resins have experienced supply allocation situations. Everyone is happy to see improvements in operations that help protect our environment and make our world a safer place to live. Right now, there is a tremendous effort underway in major Asian manufacturing countries to reduce the environmental impact of manufacturing. That effort has caused several smaller manufacturers to shut down because they cannot afford to invest or relocate, so supply capacity has been reduced impacting global supply chains. At the same time, the cost to produce at larger manufacturers is going up with the addition of new environmental controls. As a result, not only are Asian manufacturers raising prices, others around the world are joining in as well. 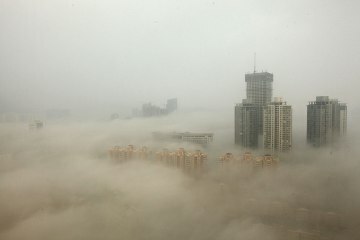 In China alone, over 30,000 companies have been penalized1 since the new environmental legislation came into effect in 2015. Previous laws focused on upfront approvals and did little to monitor operations on an on-going basis. Now penalties can climb quickly since they are no longer set based on “per event” basis but rather a daily basis, making it more financially critical to comply or simply cease operations. Typically, when we see commodity price inflation, it is related to growth in demand and shortage in supply. In Asia, we are seeing the shortage in supply effect coupled with the increasing costs of environmental compliance. Commodity price inflation in China ranges between 20 and 40 percent over the last six months. And as sourcing agents search for options elsewhere in Korea, Taiwan, and India, those prices have started to increase more than 15% as well. Those prices could come down some as supply stabilizes in the region, however, the increase in manufacturing costs will not go away. In short, as Asian environmental regulations start to catch up with the rest of the world, a primary cost advantage is being reduced resulting in higher prices globally. 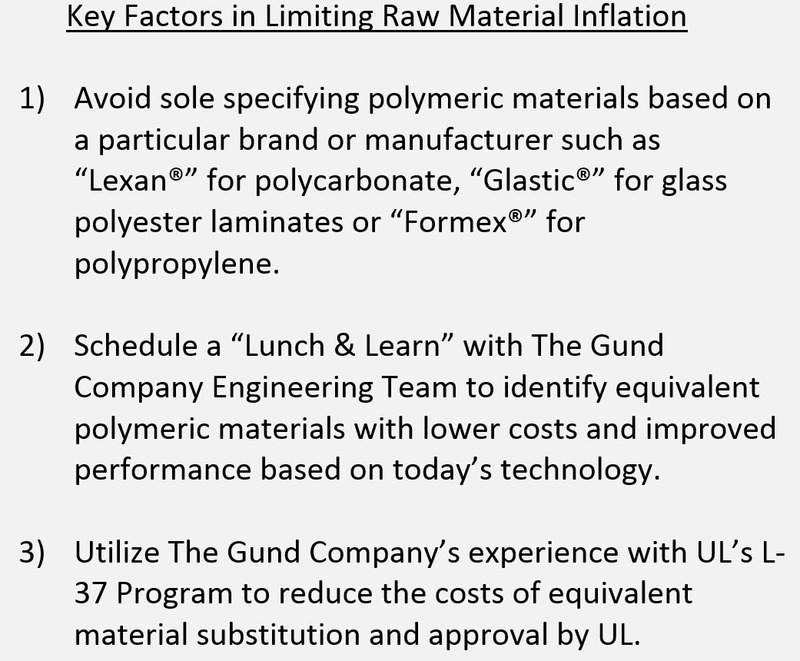 The Gund Company manufactures and supplies many materials impacted by these commodity prices including thermoplastic like polycarbonate and polypropylene, thermoset composites like glass polyester and glass epoxy, and elastomeric materials like neoprene and silicone rubber. North American manufacturers and distributors of resins and their precursors are quickly seizing the opportunity to raise prices on all of these raw materials. In January, two large polymeric material chemical producers, AOC and Ashland, both announced polyester and vinyl-ester increases of greater than 4% while epoxy manufacturing giant Hexion has announced 10-20% increases on epoxy resins and bisphenol A6 after closing its petrochemical derivatives factory in Louisiana. Polycarbonate manufacturers didn’t waste time piggybacking on this news. 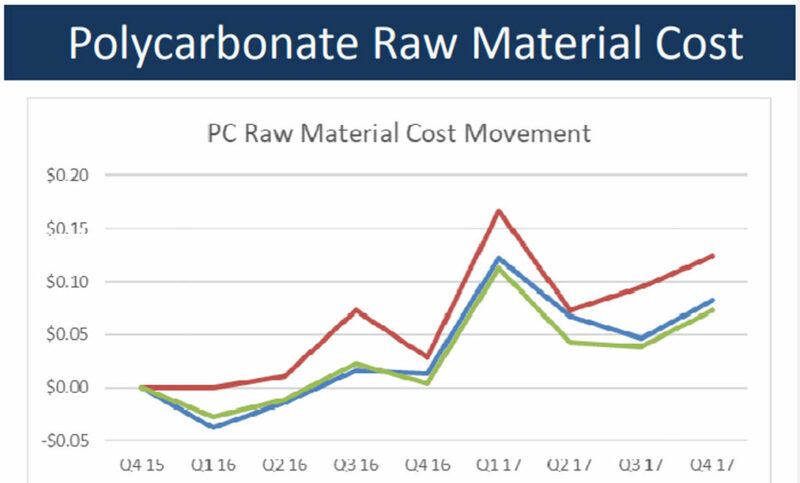 Polycarbonate saw unprecedented price increases of greater than 25% in 2017 and several manufacturers are passing along another 7% increase in early 2018. 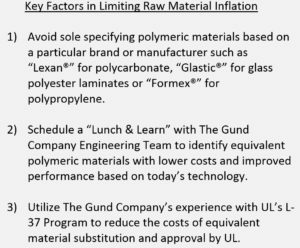 As an integrated manufacturer of many composite and thermoplastic materials, The Gund Company has some control over our supply chain. We have acted to minimize the impact of these increases in part by having long-term supply contracts in place, by having several qualified sources for various polymeric raw material inputs, and by constantly working on the continuous improvement of our processes. We continue to invest in new technology, new production equipment, and new state-of-the-art facilities around the world including our new facility in Queretaro, Mexico (2017) and new facility in Milwaukee, WI (2016). While our operations and sourcing teams are making every effort to combat this onslaught of rising prices, we are not willing to sacrifice quality and delivery performance. We are also constantly looking for opportunities to help reduce costs through alternate material options. If you are experiencing the challenges of rising prices, please contact us today to speak with one of our application experts on how to proactively reduce costs and avoid raw material cost increases.